Wash and soak moong dhal in water for 3 hours. Grind it to a paste with salt, green chillies and ginger. The batter consistency should be like dosa batter. Mix ajwain to this batter. Keep aside. Shred the vegetables (do not dice or chop it) & grate the cheese. In a pan, heat little oil and saute the vegetables with salt till half cooked. Finally add the finely chopped parsley and spring onions, saute for a second and keep aside. Mix together olive oil and melted butter. Heat a griddle, pour a ladle of the batter, spread the half-cooked veggies and drizzle the oil+butter mixture. When one side is done, flip it gently to the other side and allow it to cook for a minute. Now again turn it to the first side and spread the grated cheese & oregano on the veggie side. By doing this way the cheese will melt slightly. Now, take out and decorate with tomato ketchup and serve hot. Beautiful indianized pizza, looks fantastic..
Shanthi what an intersting recipe. 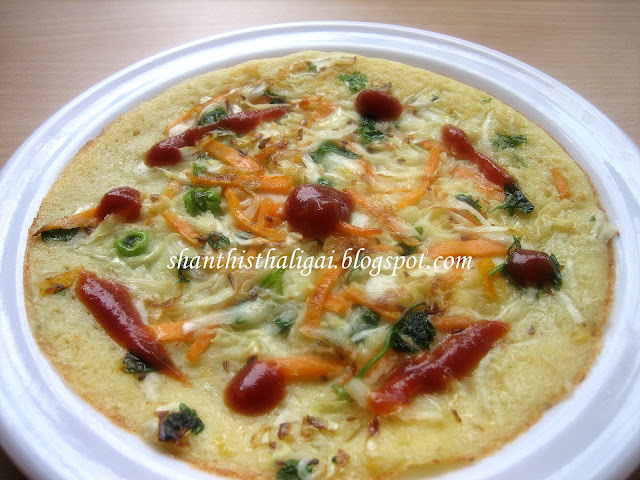 A very welcome variation to dosai and adai that we make with pasiparuppu. Thats very creative...Nice click and looks fabulously yummy!!! great job!!! A truly lovely version of the actual pizza.It is worth the try. Nice way to give Pesarattu to kids with a diff. name & decoration......iam sure they will not stop with one. Pizza looks perfect!!.. and yumm :),thank you. Lovely pizza, love the addition of moong dhal. Kids will surely love this. Shanthi Maami - looks delicious! And so healthy too with the moong daal. I should make this for my daughter soon- and for me too! Very innovative and interesting dish. This is very innovative,never thought to make pizzas in this way.Good recipe. Thats absolutely awesone ..looks tooo good and tempting. sounds interesting...very innovative..love the idea of adding moong dhal..Yummy. great idea the daal pizza!